Microsoft’s Windows 10 October 2018 Update, officially released October 2, doesn’t offer the standout, marquee features you might have come to expect from earlier releases. But as our review demonstrates, a few new features highlight a longer list of under-the-hood, day-to-day improvements. Our review is based on the final Windows 10 Insider Builds, which led up to the official October 2018 Update. Microsoft doesn’t appear to have added anything with the announcement, but we’ll check and update this story to reflect any last-minute changes. We’ve assigned a review score, but, as always, pay less attention to the number than to how the October 2018 Update will affect you. We’ve separated what we’d call “the little things”—everyday features and conveniences—into their own article, covering automated OneDrive backups, for example, and independent text resizing. Here, we’ll talk about the major new features: apps like Your Phone and Microsoft Font Maker, and how the nifty little Cloud Clipboard works in the real world. One’s particularly worth noting: Microsoft Edge. 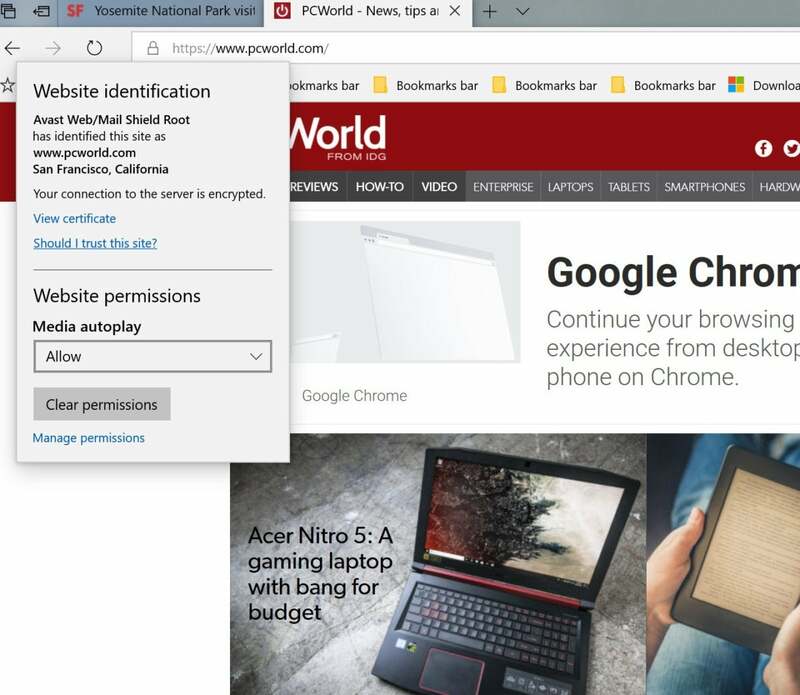 Opening 20 media-heavy tabs now feels about 90 to 95 percent of what of I would expect in terms of performance, and that’s without an ad blocker like Ghostery enabled. Pages are almost instantly navigable. The only glitch I notice is that Ctrl+Tab functionality for opening an additional tab isn’t immediately responsive. I can go back and forth between pages quite easily. Edge will “tombstone” idle pages, however, and that still slows down open tabs a bit more than I’d like. As for new features, Edge now blocks videos from autoplaying on individual websites. It works pretty well, though you’ll still see a video window or popup load even if the video doesn’t play. In fact, if you want to read a news story without ads or video, you can always click the existing “Reading view” book icon in the URL bar—it’s a great feature of Edge, and many people don’t use it. And if you do, Edge now allows you to highlight words and get definitions right within the right-click popup window, a feature that extends to ebooks. You’ll also see helpful shortcuts like “Show in folder” within the Downloads tab within Edge, which makes downloaded files easy to find. Google Chrome is still far superior to Edge in migrating Favorites via the cloud to a new machine. Edge still has trouble passing along passwords. But Edge isn’t painful to use anymore. I feel it’s close enough for day-to-day use. 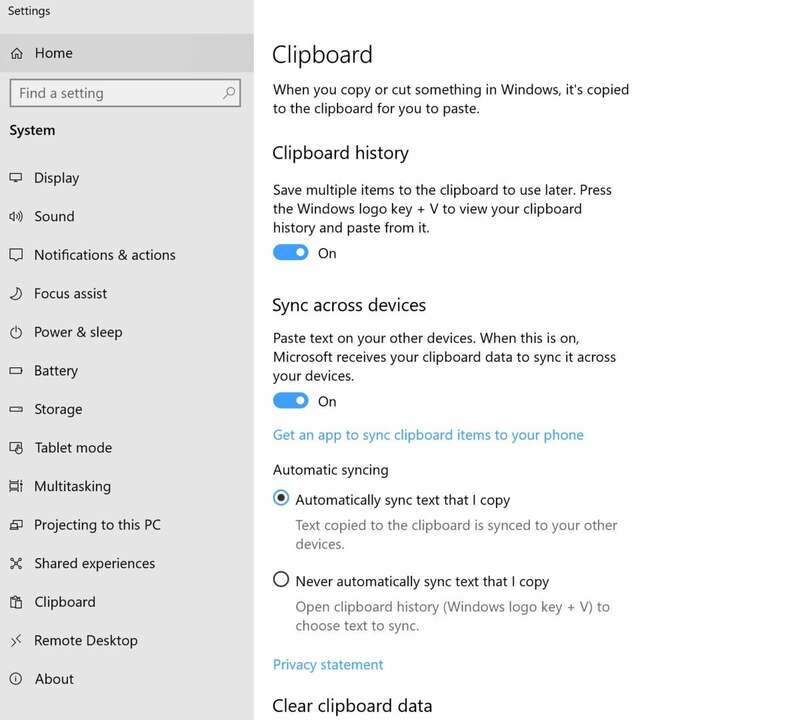 Within a new setting, Settings > System > Clipboard, you’ll see two options that you can turn on or off: “Clipboard history,” and “Sync across devices.” You’ll need to be signed in to a Microsoft account for the latter to work. When toggled on, the new shortcut Win + V opens a history of links, images, and text snippets you’ve cut and pasted, and allows you to select them again. Once you use it, you’ll see the appeal. My only problems with Clipboard’s history are that how far back it goes seems somewhat arbitrary, and that the Clipboard window isn’t movable. Pro-privacy users have the option of turning Clipboard’s cloud storage off. You can also erase what’s stored in Clipboard on your device and in the cloud, via the Settings menu. Syncing across devices is even better: It’s a fancy name for copying text from one PC (Ctrl+X or Ctrl+C), and then paste it on another. Yes, if you’re signed in, anything you cut or copy on one PC (up to 4MB) will be automagicallypasted into the app you’re using on another PC, via the cloud, by typing Ctrl+V. (Both PCs must be connected to the Internet.) The 4MB limit is a painful crimp on the feature’s utility, and it pales in comparison to the awesome Mouse without Borders app, plus other solutions for transferring files wirelessly between PCs. But the new Clipboard wins for its simplicity. Disappointingly, Microsoft ditched it. Your Phone, a new app which (may) pop up as a shortcut on your Windows desktop, now requires the Your Phone Companion app (formerly called the Microsoft Apps app) to be installed on your Android or iOS phone—yes, another Microsoft mobile app to sit alongside Edge, Bing, Cortana, or the Microsoft Launcher. (Microsoft has used some of these as phone-to-PC bridges before.) All Your Phone does is let you open, view, copy, and share photos that you took on your phone, as well as send and reply to texts. (Deleting a photo from your phone erases it from Your Phone, too.) While that’s handy, if your phone automatically backs up photos to OneDrive, the built-in Windows 10 Photos app already provides this functionality. Texts can also already be sent via Cortana, too, though Your Phone is a convenient shortcut. I assume there’s a growing frustration within the Windows team that key features within the platform like Cortana, are going unused. But do we need another app? Or if we do, is it better than Pushbullet? To be fair, Your Phone is straightforward and simple to use. What we’re seeing at OS launch is a moment in time for an app that will likely continue to evolve, just as pen and voice interactions are gradually working their way into every PC life. Let’s call it a modest start for what we know will be a future where smartphones and Windows PCs collaborate as a matter of course. Font Maker works best with a digital pen and a tablet, so from that standpoint it’s somewhat limiting. All you need to do is ink each letter and number in the provided template. When you’re finished, you’ll have created a font that you can save to Windows and use within Word, PowerPoint, or wherever. It’s simple, fun, and a bit gimmicky, but feels very Microsoft in its integration of creativity and productivity. Microsoft published over 30 separate Insider builds as part of the run-up to the October 2018 Update, and what filtered out at the bottom included some smaller features that you may want to check out. Cortana, Alexa; Alexa, Cortana: After more than a year, Amazon’s Alexa and Microsoft’s Cortana are now skills in their respective services. If you tell Cortana to open Alexa, you’ll have access to everything Alexa can do, including placing an order from Amazon. It might not be a new feature within the October 2018 Update, per se, but it’s still a new addition to Windows.